What the heck is a Vineyard Pie!? It’s grape laden wonderful bliss, that’s what. 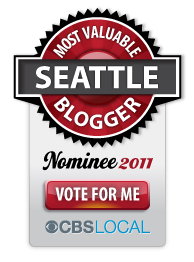 Recently, I entered a pie contest for which I will share pictures and stories at a later time. Since the contest, I have had numerous requests for the recipe of my Vineyard Pie and so everything else must take a back seat while I share the secrets of my unusual grape pie with my friends. This recipe is entirely original and my own. So like I was saying, this was a pie intended for a contest but for me it was really an opportunity to think outside the box and do something… different. The contest rules stated that the fruit had to be in season. Immediately my mind went towards things such as pears, apples, plums and the like and then something unexpected creeped into my cranium. Grapes. Yep… grapes. And so I started to do some research. 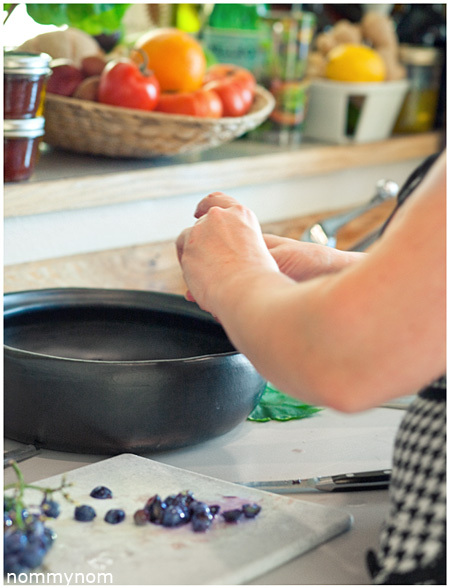 Was it possible to make a pie made of… Grapes? 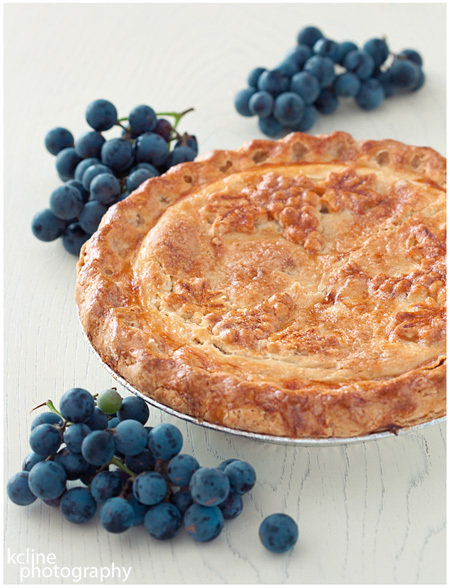 Well it turns out that it is, and Concord Grapes seem to be a big deal to pie makers in areas such as Maryland. My mind was already made up. Grape Pie, here I come! In researching recipes I found that the process in which those East Coast pies were made, had a very “jammy” interior. I most certainly did not want to create a pie that was a big crust covered piece of Grape Jam. I wanted the grapes to shine, taste fresh, sweet and have a cherry pie like texture. Upon tasting and re-tasting grapes I decided that a mix of gapes was my ticket to success. 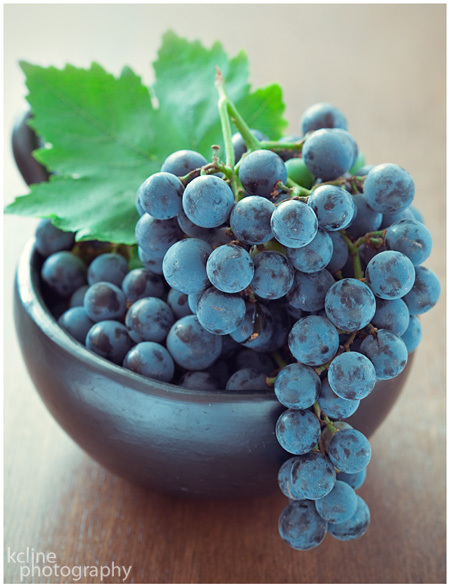 Concords lend their characteristic grapey flavor, Red Grapes for a nice sweet tart and firm fruit and Black Grapes for their honey-like sweetness. After putting all these grapes together it struck me that I practically had myself a vineyard of grapes at hand. Then a light bulb went off in my head… Ooooo! Wine!! So I grabbed some different sweet wines from my pantry to taste along with one of each of the grapes. I liked the flavor of the Port but I went with a Blackberry Dessert Wine from Pasek Cellars, which is a local Cellar located in Mount Vernon. The Blackberry Dessert Wine added a lovely fruity note that was a lovely accent to the Grapes. In the East Coast grape pies, they squeeze out the centers of the Concord, run it through a food mill to remove the seeds… yadda yadda. I didn’t want grape mush, I wanted these Grapes to be berry-like. So to prep I washed the grapes, dried them and cut them in half. Once in half the Concords revealed their little seed and a quick flick of the fingernail the seed was history and I was left with a lovely purple plump grape. The Black Grapes & Red Grapes were seedless, but I cut them in half anyway so the filling had a consistent mouth feel, and I didn’t want to have grapes bursting in someone’s mouth and squirting out. This pie was my great experiment. It has been at least 10 years since the last time I made a pie from scratch, including the crust. It is the first time I have ever invented a recipe for a pie and the first time I have ever had a grape pie tickle my tastebuds. This pie has a light yet subtly rich flavor, not overly sweet. The Grape flavor is not jammy, as my husband Rasmus put it “You can really taste the freshness of the grape.” and he is absolutely right. 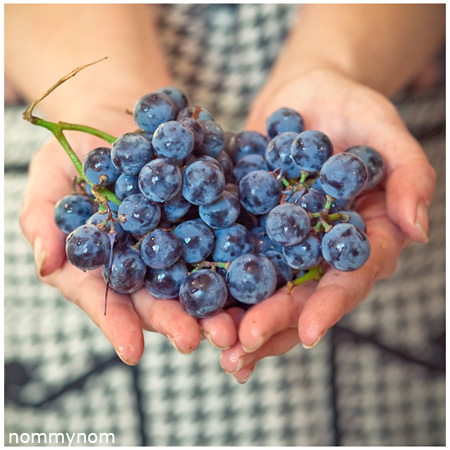 The grapes still have a fruity pop, yet their flavors have melded together. Preheat oven to 350°. Combine all ingredients together and stir to coat everything evenly. Put your bottom crust down into you pie pan. Ladle the pie filling into the unbaked pie crust, being careful not to overfill it. The filling should form a mound, flush with the edge of the pie pan and rising gracefully to an inch over the rim at the very center. If you happen to have extras, save them to make small tarts with your leftover pie crust trimmings. 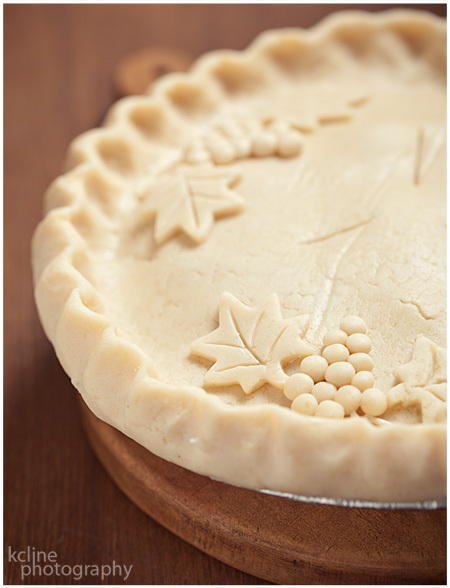 Place the top crust onto the pie and crimp the edges closed. Cut a few slits to act as vents for your filling. If you want a shiny topped pie, now would be the time to put your egg white onto the top crust, using a pastry brush. Place the pie onto a baking sheet, to catch any spillage. Make a foil “tent” for the top to protect it from over browning, make sure there is at least an inch of spacec between the pie top and the foil so that the pie has breathing room. Bake the pie for 45-50 minutes. Remove the foil tent and finish baking the crust until it is browned to perfection, right around 5-10 minutes more. Let this pie cool completely before serving, as the Tapioca needs time to set properly. This is a great alternative to Apples, pears & Pumpkins and makes wonderful Fall pie, the colors and flavors… well it’s just down right beautiful. Hope you enjoy! ***A special Thank You! to Rasmus Rasmussen for taking the shots of me in action. You are the bestest! Biggest piece of pie is for YOU! This entry was posted in Gluten Free, Recipes, Vegan & Vegetarian and tagged black grape, concord, dessert, fruit, fruit pie, grape, grape pie, pastry, pie, red grape, vineyard pie. Bookmark the permalink. As usual, I can testify to the tastiness of this. 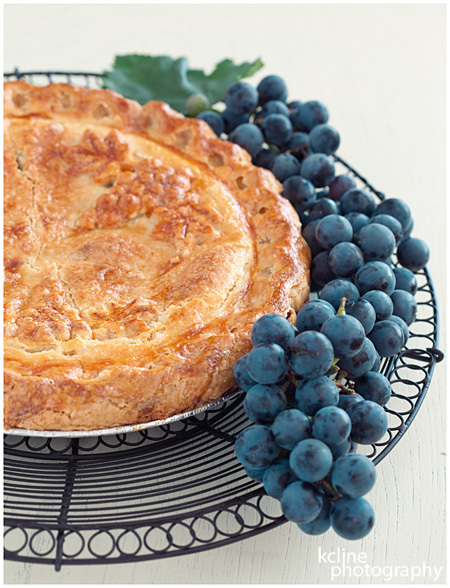 Even though grape is not my favorite pie filler, the combination of all the ingredients took it to another level. And apparently, I was not the only one who thought so (or is it a coincidence that both judges made their own grape pies right after the contest? I don’t think so). That looks great – I’d love to see a photo of a slice to have some idea of the consistency of the interior. Now all I need is an occasion to make one! Unfortunately after the judges tore into it, there was not a presentable slice to photograph. It got really mangled. The inside consistency is just like a juicy Cherry Pie filling. Been working on my Grape Pie recipe too, based on an old local recipe from Canandaigua NY where it is a local specialty. I’ll share the link with the understanding that I have to run one more test cook before I publish it. It is very different than yours. Tell me, how runny was yours? One note though… that with Tapioca as a thickener the pie really needs to cool down completely before cutting into it to properly set up. My first test run pie I cut into it pre-maturely and it was a mess due to not being warm and not fully set. I originally had half the amount of Tapioca and I increased it for this recipe, glad I did as it seemed to be the perfect amount. How long did you wait until cutting into it when it was cool? I made this last year and it was a huge mess because of the same problem. I tried it again this year and so far the results were better but not perfect yet. It’s still quite runny. I used the 1/4 cup of Tapioca flour as you suggested. Although, I will say, it may be my cooking times; I cooked mine for the times you listed and I found that to brown the crust at the end my oven needed 30-40 minutes longer. I want to make this as cherry-pie like texture as possible; What do you suggest? Hmmm yes, it may be a cooking time and difference in ovens. First time that i made this I did two pies, one that went to the contest and the other stayed at home and rested. The contest pie was a little more runny than I would have liked, but still held together when lifted from the pan (the filling didn’t pour out of the sides too much). The next day, we sliced in to the second pie to serve to friends and it was perfection, nicely gelled, but not stiff. I would suggest letting it sit longer to allow the tapioca to set up. If you cut in to it while it is still warm, the tapioca has not really had a chance to set up and gel, from my own trial and error experience. Thanks for that. What a great recipe! And I have concord grapes too, even though I live in Australia.